The votes have all been cast. They’ve been counted. And recounted. And although it was a nail-biter tournament, right down to the last trickle of votes coming in, there is indeed a winner. 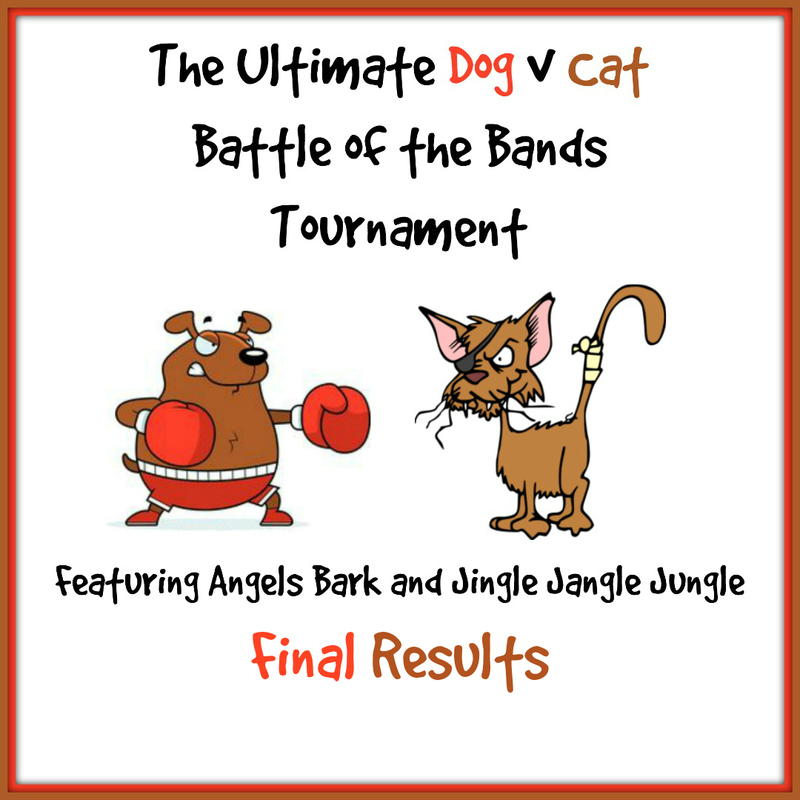 But before we announce the Grand Champion, let me first give major props to my good friend Mary from Jingle Jangle Jungle, my co-creator in this historical Dog vs Cat Battle of the Bands Tournament. Mary has been a fun and fabulous partner in this tournament event. Not only that but she also created all the tournament graphics and status charts. So to my friend Mary: THANKS SO MUCH for making this such a fun and exciting endeavor. You Rock Sister! Okay, y’all ready for the results? I’ll start off by saying: BOTH songs were winners, in my book anyway. Both songs are incredible in their own right. They are both monumental hits, in the charts and in the hearts of fans worldwide. These two songs are also winners in this tournament, both figuratively and LITERALLY (which I’ll explain in a minute). CATS IN THE CRADLE by Harry Chapin! Now for all those Led Zeppelin and Dog folks who may be disappointed, don’t be! Because BLACK DOG was in fact a winner HERE at Angels Bark! Remember we had two blogs featuring this battle. Here at Angels Bark, Led Zeppelin’s BLACK DOG came rocking in with the win title and a vote tally of 11 to 6 (11 voted for Black Dog, 6 voted for Cats in the Cradle). That’s a pretty impressive win, yeah? It is. So how then did Harry Chapin & Cats in the Cradle win the Tournament? Because Mary is a much better bigger blogger than I am (Say that three times…). Mary’s battle saw a total of 26 votes come in (nearly ten more than here at this blog) with a majority 19 votes cast for Cats in the Cradle (19 for Harry Chapin, 7 for Led Zeppelin; whereas Angels Bark’s 17 voters cast 11 for Zeppelin, 6 for Chapin). Indeed, a very close battle, well fought by two superstars. In the end, I’m okay with this result. Harry Chapin’s poignant lyrics delivered a real punch to the gut and a jolt to the consciousness to many who heard –and felt– its very powerful message. 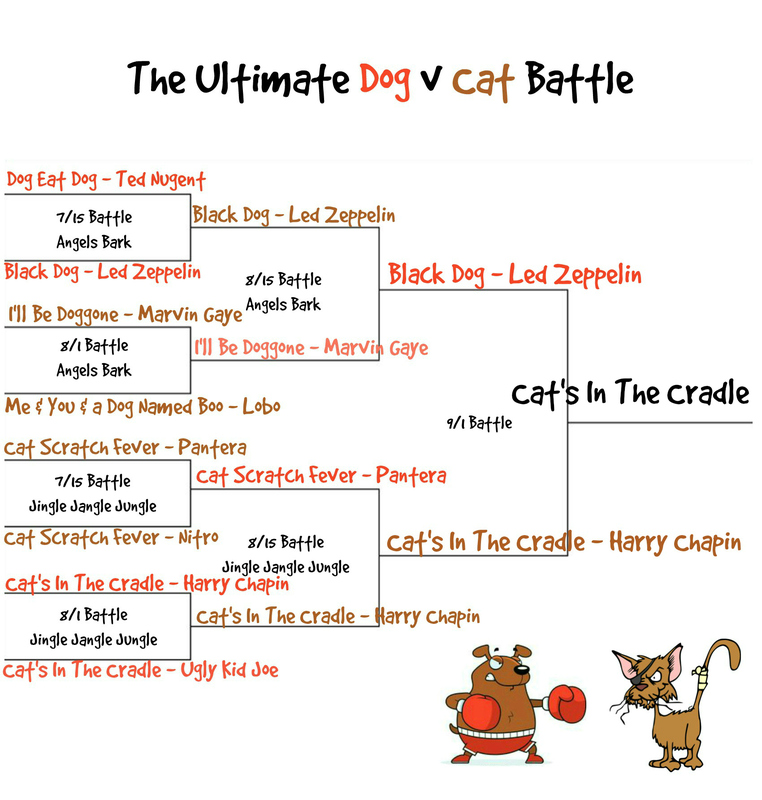 The title of Grand Champion in the Ultimate Dog v Cat Battle of the Bands Tournament is a well-deserved recognition for Cats in the Cradle. This entry was posted in Stories by greyzoned/angelsbark. Bookmark the permalink. I’m not sure what this outcome means on the whole, but for me as I grow older I kind of prefer the mellower stuff. And actually age probably has little to do with my preference now because if you’d asked me back in the seventies I’d still have preferred Chapin. Knowing you as I have over these past few years, I believe that. What does it mean on the whole? I don’t think it means anything but a bunch of fun in the end. We had a good time with the tournament idea and execution; we hope our readers enjoyed it as well. Thanks for your participation Lee. Thanks for reporting the outcome, Michele. The dogs are licking their wounds, but will live to battle another day. Enjoy your weekend, dear friend! I enjoy reading these but I never get down to hearing the songs or voting. Maybe I’ll change that in future – because I like BOTH these! Well, shoot! Just as I suspected – I forgot to comment here when you posted. Taking care of that now! This tournament was a lot of fun. I think now that we’ve made it through the inaugural tourney, our next one will be that much better! I should start making a list of potential songs to use, eh? Hope you have a much better week than the last! Call if you want to just shoot the breeze or if a crazy idea pops into your head. Cats rule, dogs drool! lol Seriously, I love both cats and dogs. There’s no one pick here and I loved y’alls battle collaboration. It was a lot of fun! The three “Black Dog” covers are so different. I’m glad you’re not asking me to vote on one of these. 🙂 Thanks for stopping by on Saturday. I don’t know if you meant to not vote but you didn’t. I just wanted to throw that out there for you BUT you don’t have to. I know how busy one can be and sometimes you mean to do one thing and it’ll slip your mind just like that. This is coming from the voice of experience. Have a good week and let’s hope things get easier for the both of us. TTFN! The tournament was a ton o’ fun! I was surprised that the final outcome was so close, because as I saw the votes coming in at Mary’s place, Chapin’s ‘Cats’ had such a commanding lead there was no way I foresaw this being ending with just a 5-vote differential. Apparently the 180-degree reverse of what was happening at ‘Jingle Jangle Jungle’ was happening here at ‘Angels Bark’. I hope y’all do this again, either with dogs and cats or any other theme. It was a very clever approach to BOTB. POSTSCRIPT: I just check-marked the box that says “Notify me of new comments via email”, even though I know it won’t.